We are currently using white snapdragon to replace the white stock in this bouquet. At this time of year when we hold tradition especially dear, there will always be a place in our homes and hearts for a classical red, green, and white Christmas bouquet such as this one. 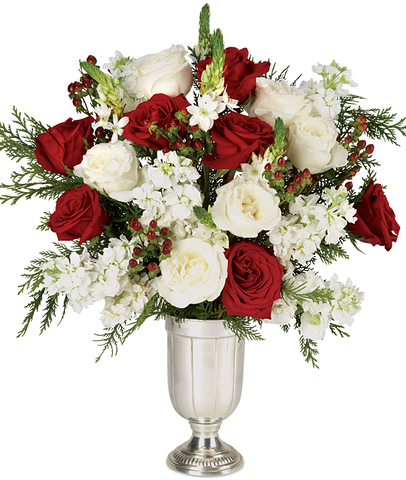 Sweetly fragrant, it combines a dozen long-stemmed roses (six red and six white) with stars of Bethlehem, red hypericum berries, fragrant cedar, and spicy white stock. Presented in our substantial trophy vase, it’s designed to hold center stage at any gathering, be it formal or more casual. Remove all foliage that will fall below the water line. Remove the “guard petal” on each rose – this is the outermost petal left on to protect the bud during shipment. You may also remove any petals that may have slightly bruised during shipping. We recommend cutting rose stems underwater for best blooming results. Always add fresh water daily. Trim away spent blossoms as your bouquet ages and rearrange if necessary. 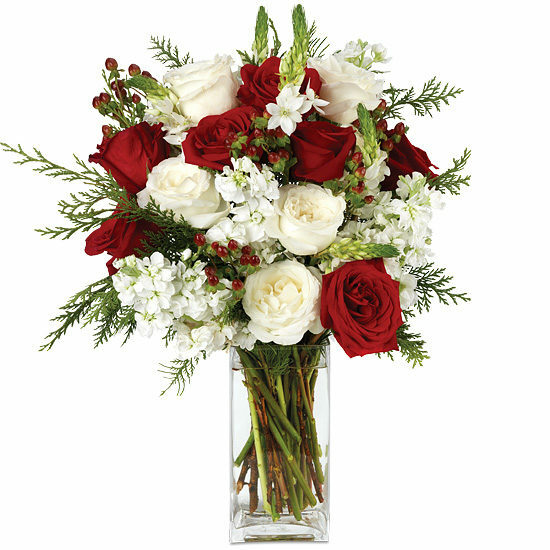 Cut greens to small branches and place here and there throughout the bouquet.